We really want meals to be a relaxed time when everyone can enjoy delicious and nutritious food, as well as great conversation. Our recently constructed “post and beam” (Amish built) Dining Hall can easily accommodate 200 campers and 100 staff members at one time and is furnished with tables which seat six (four campers and two staff members). Boys and girls eat at the same time, but sit separately. 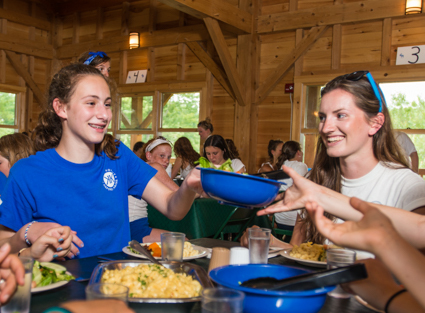 Meals are served “family style,” with thoughtfully assigned seating to give children the opportunity to sit with friends and to meet other members of our camp community. One person from each table goes to the serving window to pick up a tray of food and brings it back to the table, where the counselor serves each person at the table. Each mealtime includes a main course, supplemented by a variety of offerings on our hot and cold buffet carts, providing lots of healthy and tasty choices. Some examples of main courses are: blueberry pancakes for breakfast, build-your-own-burritos for lunch, and turkey with all the trimmings for dinner. Hot cart offerings might be oatmeal or cream of wheat for breakfast; there is always some sort of pasta and homemade soup on the hot cart for lunch and dinner. The cold buffet cart regularly includes yogurt, granola and fresh fruit at breakfast time. At lunch and dinner times, the cold buffet cart includes lots of different vegetable and protein salad options, complemented by a variety of fruits and tasty side dishes. 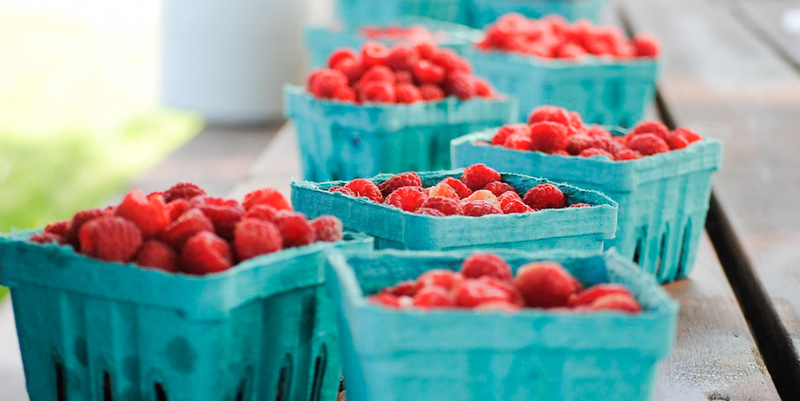 We try to give campers lots of healthy and delicious choices. Seasonal fruits are served for a mid-morning snack, while crackers and similar light snacks are available in the evening.